The results from the 2013 fall SCN sampling project are in. This project was a joint effort coordinated by the NDSU and U of MN Extension Services and was funded by the North Dakota Soybean Council and the Minnesota Soybean Research and Promotion Council, respectively. 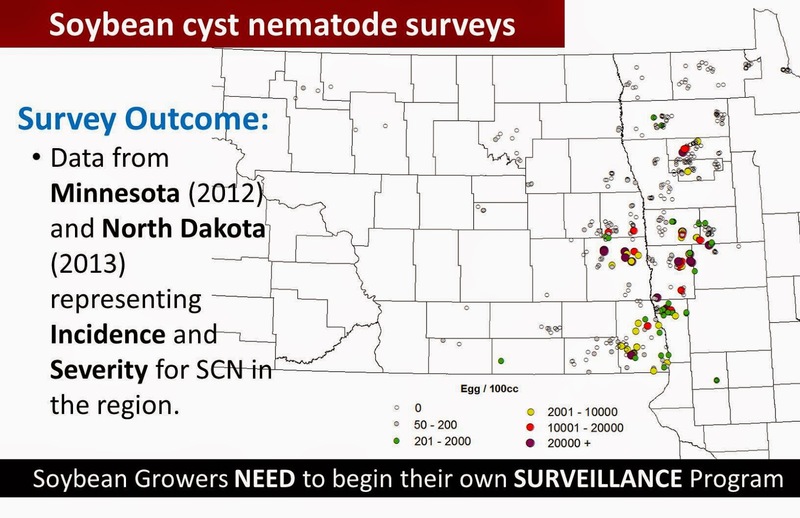 The summary presented here combines two separate survey efforts for the two states (2012 - Minnesota; 2013 - North Dakota), but presents a regional view of what is happening with the expanding range of SCN infestations. How did the sampling project work? This was a grower-based effort. Growers, consultants and Extension agents were given SCN sampling bags at SCN-based field days and Extension offices; they sampled for SCN, sent the bags into the lab for analysis, and got the results back. Dr. Markell and myself were given the data on egg infestation levels and the geographic locations where they occurred. Using the geo-referenced data, we constructed a map summarizing infestations and a sense of their distribution across the landscape (Figure 1). Figure 1. SCN egg levels detected in ND and MN in 2013. Eggs/100cc is the standard unit used to measure the amount of SCN in a 100cc soil sample. This is determined by microscopic examination in a laboratory. 50-200 eggs/100cc = a very low level of eggs were found. This may indicate that SCN is present, but, it may also be a ‘false’ positive (explanation below). 201-2000 eggs/100cc = Low level of SCN. 2001-10,000 eggs/100cc = A moderate level of SCN. 10,001 eggs/100cc = A high level of SCN. 20,000 eggs/100cc + = A very high level of SCN. First, the majority of the samples from the survey came back negative. SCN is spreading, but it is not in every field yet. Importantly, much of this was targeted sampling, meaning samples were trying to find the hot spots. As a region, we are generally in a good place to manage the problem before it becomes a major problem. Second, there are many ‘low –level positives (50-200). Some of these may be real, but some are possible false positives. In the nematode extraction process used at the laboratories, nematode eggs are counted. However, because you can’t count through much of a soil sample using a microscope, a sub-sample (1/50th of total) of the collected material is inspected and the counts are multiplied by 50 for the sample total. An egg count of 50 really means only ONE egg was observed, 100 means TWO eggs were observed, and so on. This introduces room for error. Additionally, there isn’t any way to be sure that the egg is from SCN, perhaps those ONE or TWO eggs could be from another nematode, or something else, or maybe not even an egg. So, we recommend that these low level positives should be viewed with some skepticism. If you have a low level positive in your field, we suggest you do more sampling. Neither of us wants everyone in Renville County, ND or Lake of The Woods County, MN panicking because of a low level positive. We would however, recommend sampling. Third, there are some alarmingly high numbers, particularly in the Southern Red River Valley. Fields with egg levels in excess of 10,000 egg/100cc will definitely experience yield loss (at least in spots of the field) if SCN is not managed, and may experience yield loss even if it is managed. Lastly, there are virtually no samples taken from the Northern Red River Valley. We are basically ‘operating blind’ in that area. Previous work at NDSU has shown confirmations in Pembina County, ND, and only low levels in the northern most counties of Minnesota by UMN Extension. We have SCN all around us, and its spreading. This disease can cause major yield loss, but, we can manage this disease. The first step is to sample to determine if you have it. We want to thank all the growers, consultants and agents who helped with this effort. Without your efforts it would not be possible. Similarly, we thank the North Dakota Soybean Council and the Minnesota Soybean Research and Promotion Council for the funding to do this.